The Diamond Skid XL is a premium quality, reliable, efficient industrial reverse osmosis drinking water purification system for use in high output applications. It is designed to efficiently produce high quality purified water that can be used for drinking water operations or any operation calling for pure clean water. 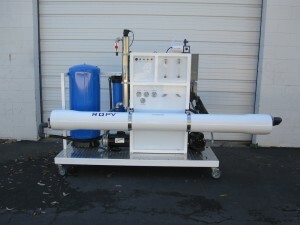 It can be configured to include a full water delivery system as well, allowing it to be more than just an industrial reverse osmosis filtration system, and be interfaced with various components such as fillers and bottlers. The Diamond Skid XL is used in applications such as water purification plants, bottling plants, water pouch plants, pharmaceuticals, beverage production, manufacturing processes, tech industry applications, and various other uses requiring pure water. The Diamond Skid XL is a TFC membrane reverse osmosis water purification system producing between 20,000 to 60,000 gallons per day dependent on model. This system produces purified water below 10ppm and can be configured to produce purified alkaline water. The Diamond Skid XL features an exclusive design that ensures reliable operation and low maintenance costs. This reverse osmosis system consist of basic electrical components, that are easily accessible worldwide, and does not contain any fail prone microprocessors or proprietary parts like other systems. These reverse osmosis water purification systems are built upon order and our skilled technicians can customize the system to fit your specific application and needs in the most efficient reliable design possible. All systems are designed, manufactured, and assembled in the USA with NSF approved components. The system is on a locking wheel frame allowing it to easily be moved, shifted, and transported yet secure when in its operating position. The Diamond Skid XL reverse osmosis water purification system is very easy to install, user friendly, and comes with a detailed guide specifying installation, maintenance, and operational procedures. A 1 year warranty on parts from manufacturer defect is included as well as continuous phone and email technical support. STEP 1: 5 Micron Pre-Filter – removes particles, sediments, and algae. STEP 2: R.O. Pump – high pressure, stainless steel pump to boost water pressure to 160 lbs. for maximum membrane efficiency. STEP 3: Reverse Osmosis Membrane – water is forced through a semi permeable, .0002 micron membrane, allowing only pure water molecules to pass. STEP 4: Storage – water is stored in FDA approved tanks. STEP 5: (Optional) Storage—water is stored in FDA approved tanks. STEP 6: (Optional) Repressurized System— a 20 G.P.M. pressure pump assures constant water supply from storage tanks to post carbon filter, ultra-violet sterilizer, and faucets. STEP 7: (Optional) Pressure Tank — 33-gallon pressure tank assures a constant flow of water to the filler and prolongs pump life. STEP 8:(Optional) Post-Carbon Filtration — water travels through a 4.5”x20” big blue Post Carbon filter, polishing it for exceptionally smooth taste. STEP 9: (Optional) Ultraviolet Sterilizer — 25 G.P.M. stainless steel sterilizer eliminates up to 99.9% of all bacteria. STEP 10: (Optional) — ozone may be added to water storage tanks to prevent future bacterial growth. 5 Micron Pre-Filter: 4”x20” cartridge on 20,000-30,000 GPD systems. Bag type on all other models. Please contact us before ordering with all inquiries and questions regarding equipment, applications, installation, or any other matters. Our friendly and helpful customer service and sales departments can be reached during our standard business hours; Monday-Friday 8am-5pm Pacific Standard Time. We recommend you obtain a water analysis test in order to determine contaminants present in the water supply and to optimize the system to fit your specific parameters. You can reference our Water Problems Page in the top menu bar or call our customer service department to better understand water problems, effects of contaminants, and their solutions.